Advocates for increasing the paychecks of low-wage workers held twin rallies in Pennsylvania on Tuesday. In Harrisburg, politicians, religious, community, and labor leaders gathered at the Capitol Media Center to announce a push to raise the minimum wage to $10.10 from the current $7.25. 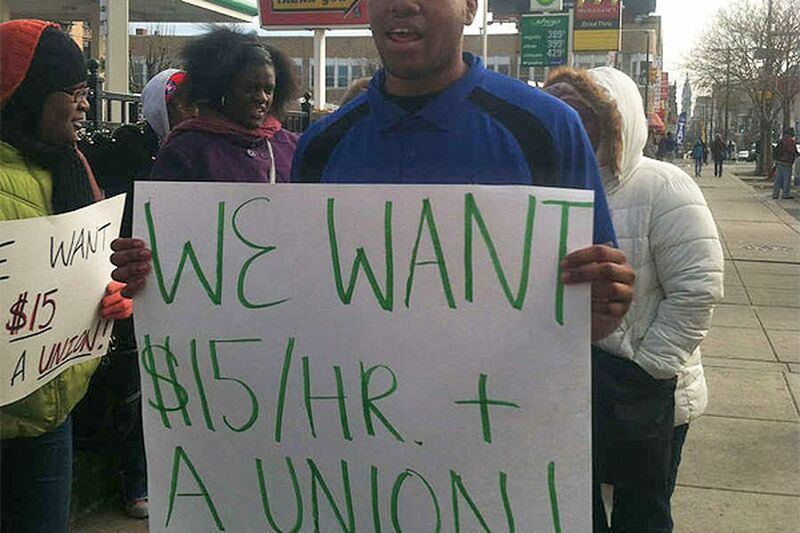 And in front of a North Philadelphia McDonald's, restaurant workers, activists, and labor officials met to urge the fast-food giant to pay its workers $15 an hour and to not interfere with their joining a union. "We're overworked and underpaid," said Aymaesha Thompson, 19, a single mother who lives in Philadelphia and who joined the protest before crossing the parking lot to start her shift at the McDonald's at Broad Street and Girard Avenue. She said she earns $7.50 an hour - 25 cents higher than Pennsylvania's minimum wage - and has not gotten a raise in the two years she has worked at the restaurant. The McDonald's rally was part of a national campaign, "Fast Food Forward," largely organized by the Service Employees International Union. The campaign, which has gone on for more than a year across the nation, leading to multiple one-day strikes, has now arrived in Philadelphia. Organizers said there were similar rallies planned in 30 cities Tuesday. About 50 people showed up for the one here. A manager at the McDonald's at Broad and Girard referred calls to John Dawkins 3d, president of Jo-Dan Enterprises in Bala Cynwyd, owner of that franchise and eight others. Dawkins did not return a call seeking comment. Instead, McDonald's Corp. provided a statement, refusing to answer other questions. "McDonald's and our independent owner-operators share a concern and commitment to the well-being and fair treatment of all people who work in McDonald's restaurants," the statement said. Dawkins serves on the board of the Urban League in Philadelphia and has been an officer of the local chapter of the Black McDonald's Operators Association. Brandon Stevens, 20, was among four of Dawkins' employees who attended Tuesday's rally. He said he applies for better jobs constantly. "I'm trying, but it's hard. I put in three apps a day," he said. The $7.50 per hour that he has earned in the two years he has worked at the restaurant has to cover child care for his 3-year-old son, Stevens said. Tuesday's rallies come at a time when pay for low-wage workers is commanding headlines - and political action. In January, New Jersey's minimum wage was increased to $8.25 from $7.25, after the state's voters solidly backed the change. President Obama, in his State of the Union address, pushed to boost the minimum wage to $10.10. "Most of our members are paying more than the minimum wage," said Melissa Bova, government-affairs representative for the 7,500 members of the Pennsylvania Restaurant and Lodging Association, a trade group. Bova said raising the minimum wage would hurt restaurant members who operate on thin profit margins, typically about 4 percent. A McDonald's franchise owner, she said, is doing well if he can pay himself $50,000 after expenses. "The 'Fight for $15' is a fight against common sense," said Michael Saltsman, research director at the Employment Policies Institute, a Washington economic-research organization that opposes minimum-wage increases. The institute has long argued that raising the minimum wage will actually hurt workers because companies will cut hours or lay off workers. That's not how Justin Watson, 29, of Logan, sees it. The $8 an hour he earns working for the McDonald's at Broad Street and Allegheny Avenue "is barely enough to put food on the table, barely enough to get car fare." For him, the struggle is a worthy one. "I'd rather accept the fact of losing the fight," Watson said at the rally, "than accept losing, and not having fought the fight at all."